Estimation is more than rounding. Most of the time we don’t teach this, but it is. Tabitha (8 years old) had a homework assignment the other night that asked her to imagine she had $100 to spend in a catalog, and to make a list of things she would like to buy from that catalog. She found the latest American Girl catalog and got to work. There was a table to fill out with three columns. A couple minutes later she asks, What’s the estimate if it costs five dollars? Should I write $5.01? She has discerned that estimate means write down a number that is not the exact value. But that’s not what estimation is about at all. Estimation is about finding a number that makes sense, and not worrying about whether it’s the exact value or not. 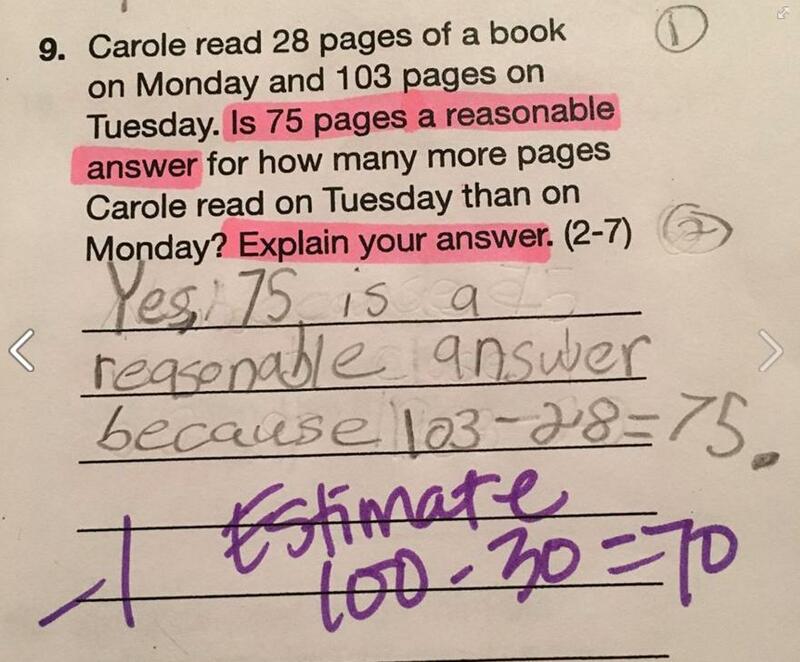 “Is this reasonable?” is a great estimation question. Rounding is one way to answer the question. But if a kid can quickly find a number that makes sense and it happens to be a precise number, then we probably haven’t asked a good estimation question. 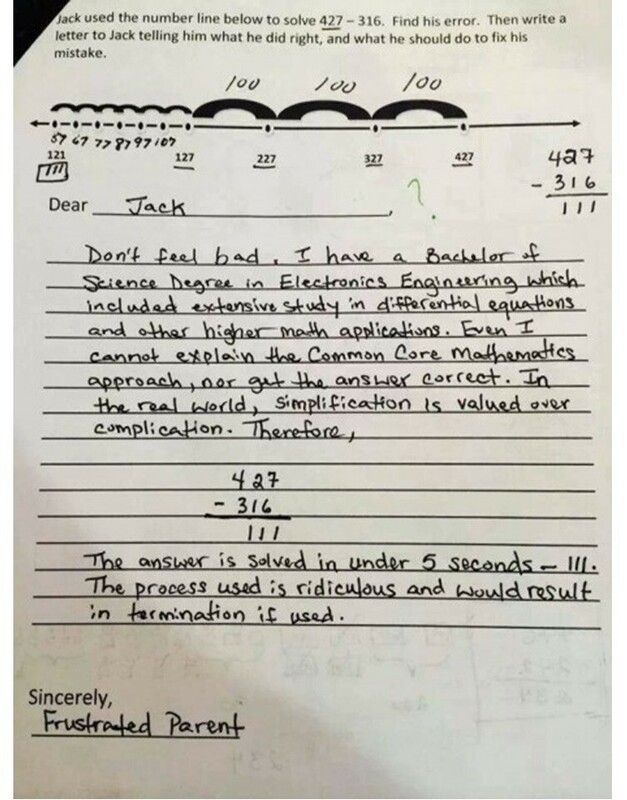 Rather than mark it wrong because the kid didn’t round, we should ask this kid a more challenging question next time. What does a good estimation question look like? What would be more challenging? Estimation 180. Thinking of a number that makes sense is much more interesting when you have to bring your knowledge of the world to bear. 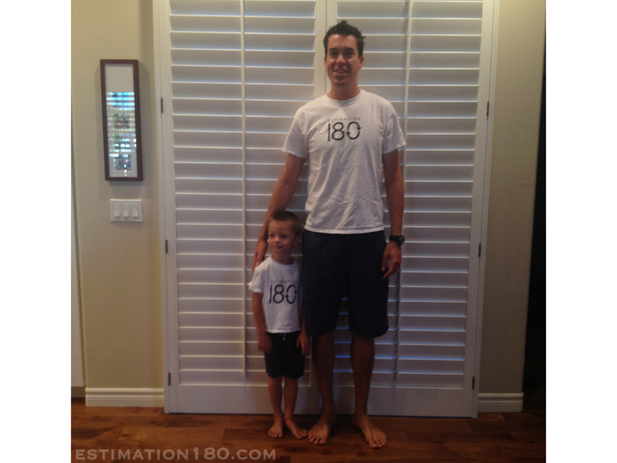 Is 75 inches a reasonable answer for the difference between the father’s height and the son’s? Is 75 centimeters reasonable? Oh! And here’s the first in a nice sequence about numbers of pages. My 5 Reasons Not to Share post has gained new life in the last week. It is evidently being shared widely on Facebook. One consequence of this is that I am getting daily emails from people who read the piece and feel moved to comment. I do believe the Internet ought to facilitate dialogue. So I have been replying to these emails. Sometimes, people leave a wrong email address in the contact form and they bounce back. So, in a show of good faith, I share with you a recent email and my reply. Perhaps Gavin will come back to the blog and read my reply. Perhaps he will not. I am not sure how to comment on the article because you have banned commenting on them. I do not have a twitter and therefore cannot join the disucssion there. I hope that you’re not intentionally trying to cast a positive light on Common Core but are instead trying to give an unbiased account of it. Thank you for taking the time to read, and to write. I just want to clarify that my claim was not that number lines do not appear in the Common Core. They do appear there, as you point out with your citation. You are completely correct. I stand by that claim. Even the number line standard you cite in sixth grade doesn’t reference the number line as a way to understand multi-digit subtraction. Instead the spirit of that standard is to use the number line as a way to represent negative numbers (such as -9 or -1/2), and then to understand the coordinate plane. Simply put, if students are going to graph functions in algebra, they will need to work with number lines in earlier grades. As for the comments thing…I was saddened to have to turn them off for that 5 reasons post. But I am committed to maintaining a reasoned and productive tone on this blog. The comments (both pro- and con- on the Common Core) were spiraling out of control and I simply did not have the time to manage them. It seems clear to me that people are able to comment on the piece as it gets shared on Facebook, but I don’t have access to the comments on other people’s shares so I cannot speak to their quality, and I am not responsible for them in the way I am when they are on my blog. Finally, you can search my blog for “Common Core” and find that I have made some rather pointed critiques of some specific standards in the Common Core—including engaging and arguing with Bill McCallum (a Common Core author) on matters involving rates, ratios and unit rates. All on the record, and you would be welcome to join the conversation in comments on those posts. I have no interest in promoting CCSS. I do have an interest in making sure that critiques are honest and fair. Best wishes and thanks again for writing. 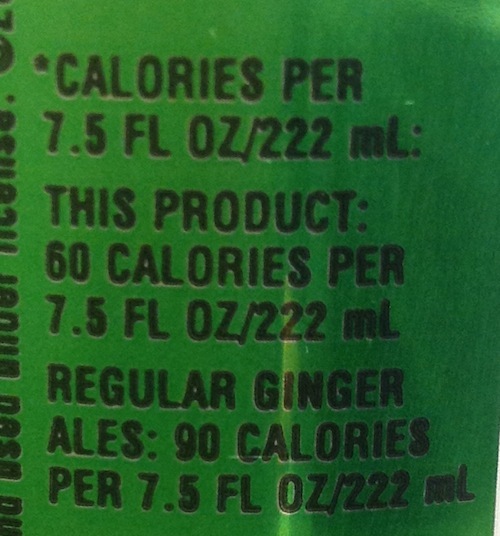 So I’m looking at the can instead of grading like I should be and I notice the “25% fewer calories than regular ginger ales” claim. And I think what any skeptical consumer ought to think. Sure fewer calories in the mini can. Duh. They have controlled for the size of the can. Nice. This one has 60 calories per 7.5 fl. oz. Regular ginger ales have 90 calories per 7.5 fl. oz. I am briefly satisfied. And impressed. But wait! 60 is 25% less than 90? ARGH! 25% means at least 25%, and Seagram’s chose this nice simple number over the more complicated . It really is exactly 25%. But we know that calorie counts are rounded to the nearest 10 calories. This second explanation leads to a sort of lovely task. How can we characterize the set of possible calorie counts for 7.5 fl. oz. 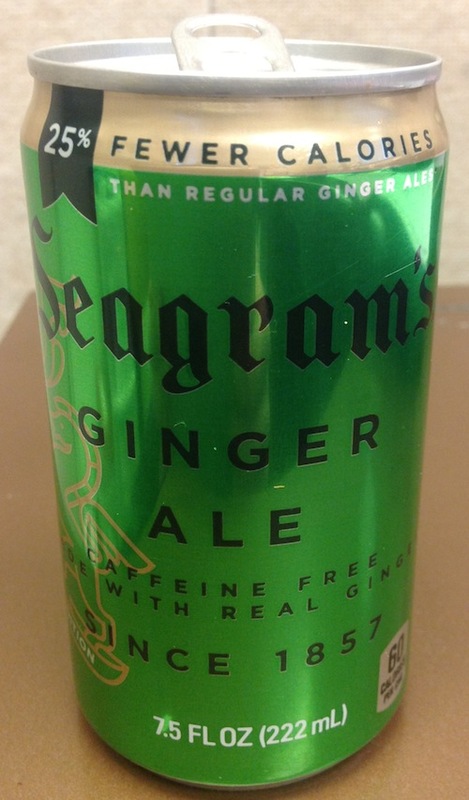 of Seagram’s and of regular ginger ale so that, (a) the counts round to 60 and 90, and (b) one number is exactly 25% less than the other? Extra credit: Which standards for mathematical practice are you using as you solve? Double extra credit: Which of my abbreviated list of standards for mathematical practice (see below) are you using as you solve? And which was I using as I gazed at my can of ginger ale? Prof. Triangleman’s Abbreviated List of Standards for Mathematical Practice. PTALSMP 1: Ask questions. Ask why. Ask how. Ask whether your answer is right. Ask whether it makes sense. Ask what assumptions you have made, and whether an alternate set of assumptions might be warranted. Ask what if. Ask what if not. PTALSMP 2: Play. See what happens if you carry out the computation you have in mind, even if you are not sure it’s the right one. See what happens if you do it the other way around. Try to think like someone else would think. Tweak and see what happens. PLALSMP 3: Argue. Say why you think you are right. Say why you might be wrong. Try to understand how someone else sees things, and say why you think their perspective may be valid. Do not accept what others say is so, but listen carefully to it so that you can decide whether it is. See also my Desmos graph of this relationship. The Decimal Institute is winding down. This week, I have a short post outlining the relationship between our discussion these past weeks and the Common Core State Standards (with links). Then next week we will wrap up with a summary of what I have learned and an invitation to participants to share their own learning. Use decimal notation for fractions with denominators 10 or 100. For example, rewrite 0.62 as 62/100; describe a length as 0.62 meters; locate 0.62 on a number line diagram. One of the issues we have been wrestling with in the Institute has been how much decimals are like whole numbers and how much they are like fractions. In light of this conversation, I found the following statements about comparisons interesting. CCSS.Math.Content.1.NBT.B.3 Compare two two-digit numbers based on meanings of the tens and ones digits, recording the results of comparisons with the symbols >, =, and <. CCSS.Math.Content.2.NBT.A.4 Compare two three-digit numbers based on meanings of the hundreds, tens, and ones digits, using >, =, and < symbols to record the results of comparisons. CCSS.Math.Content.4.NBT.A.2 Read and write multi-digit whole numbers using base-ten numerals, number names, and expanded form. Compare two multi-digit numbers based on meanings of the digits in each place, using >, =, and < symbols to record the results of comparisons. The phrase, Recognize that comparisons are valid only when the two decimals refer to the same whole, struck me as odd. If I am comparing 0.21 to 0.5, I need to make the whole clear, but if I compare 21 to 5, I do not? This seems to be an overcommitment to decimals being like fractions rather than like whole numbers. Or not enough of a commitment to the ambiguity of whole numbers. 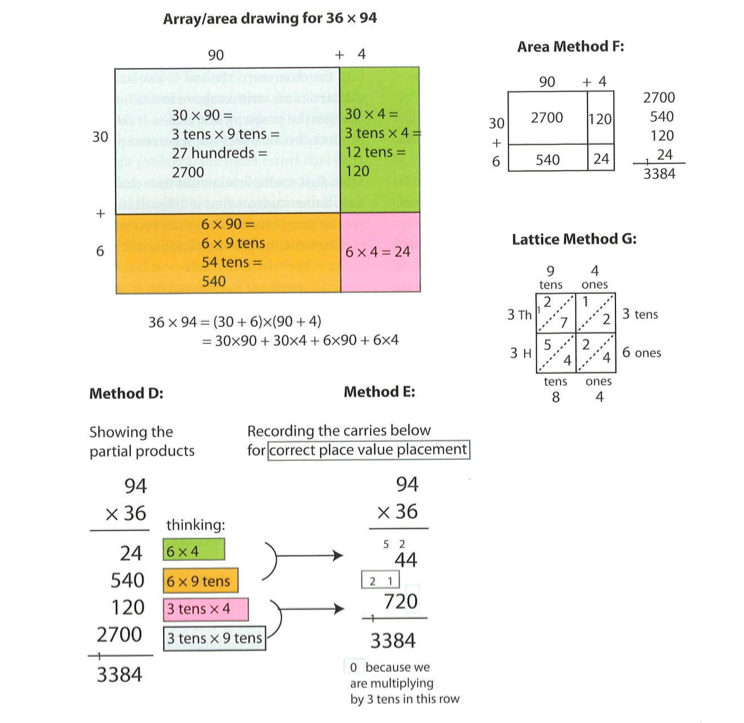 In any case, the treatment of decimals in the Common Core State Standards is probably one of the major challenges for U.S. elementary teachers, who may be accustomed to curriculum materials that emphasize the place value similarities of decimals to whole numbers rather than the partitioning similarities to fractions. I will provide some examples of pre-Common Core U.S. curriculum in the Canvas discussion to support this claim. Join us over there, won’t you? Non-U.S. teachers, please share with us your observations about how these standards relate to curricular progressions you are using. An international perspective will be quite useful to all of us. And please start thinking about what you can do in the coming weeks to share/demonstrate/document/extend your learning from our time together. Consider it your tuition to the Institute. The article, “Standard Algorithms in the Common Core State Standards” by Karen Fuson and Sybilla Beckmann, published in the National Council of Supervisors of Mathematics journal last fall, was recommended to me this weekend. It’s a weighty one, and relevant to conversations we have had on blogs and on Twitter in recent months, so I didn’t want to read it alone. I asked who was in for a reading group and got quite a few responses. The article is available through Beckmann’s website (scroll way down to the “Some Other Papers” heading). I have no experience organizing this sort of thing, but it seems that a hashtag is appropriate. I have investigated the matter and #algorithmchat is both clear on Twitter and communicates at least part of our purpose. I considered trying to organize synchronous discussion, but it seemed too controlling and impossible to establish. So I vote we discuss by hashtag on Twitter. Anyone who ends up being moved to go long form can include include the #algorithmchat hashtag in a tweet to their post. I have not read the article yet. It was passed along to me by a colleague with whom I was leading a professional development session. She really appreciated the comprehensive nature of the piece (again—it’s a long one). I have respect for the work of both authors. Fuson’s clear research-based descriptions of what children have to do in order to understand “number” has been very helpful in the work I do with elementary teachers, and I used Beckmann’s Math for Elementary Teachers book for a few years in my courses, where I found it to be the best of the available formal textbooks for these courses. I no longer use a textbook for these courses, but if I needed to, I’d go back to hers for sure. I met Beckmann at a conference a few years ago and I found her thoughtful and open to conversations about learning (not always the case in mathematicians writing textbooks, I have found). It will probably be midweek before I can carve out time to read the piece and weigh in. In the meantime, I encourage you all to dig in as you are able, say ‘hi’ on Twitter and pass along your longer tidbits in the form of blog posts, and (if you are so inclined) interpretive dance. Oh, and invite your friends, relatives and enemies to the party. This will be fun.